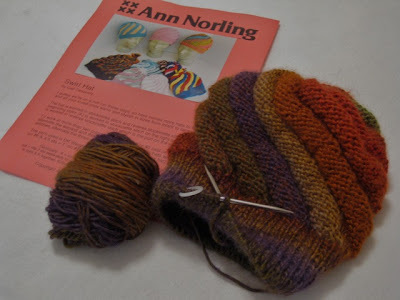 My knitting has almost slowed to a crawl, but I am nearly finished with this Swirl Hat. The hat is knit flat and seamed. 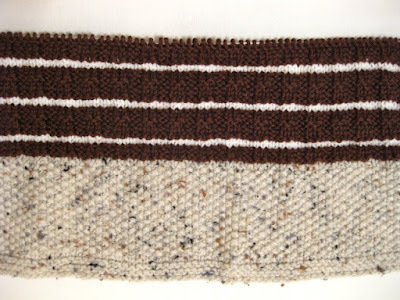 Stitches are picked up around the edge for the ribbed band. 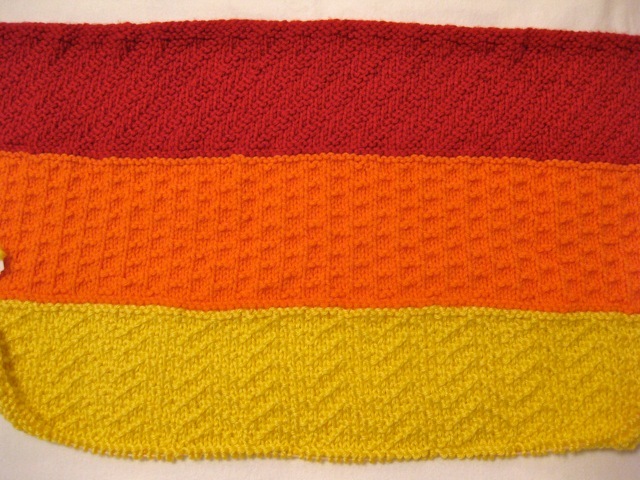 The pattern includes directions for infant through adult sizes. Since this is post 1,000 on Wyoming Breezes, the pattern (sorry, it's still chilly here, so I am keeping the hat) and a skein or two of yarn will be sent to someone who leaves a comment on this post. The winner's name will be drawn on March 2, 2012. 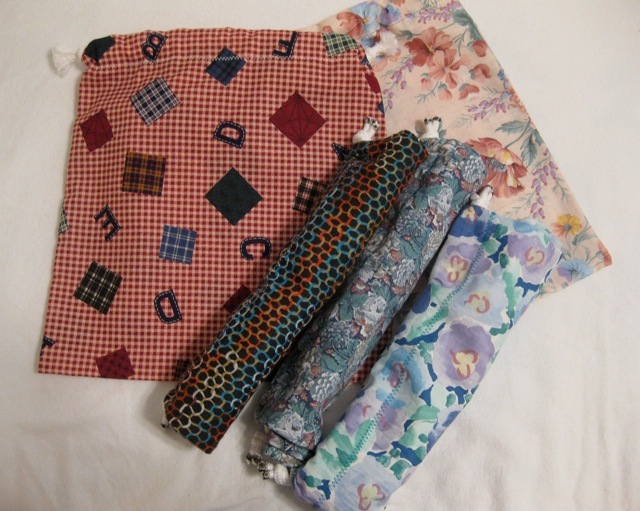 Look for a quilt-related give-away tomorrow. You may enter one or both of the drawings. Chocolate-Mint is ready for donation. 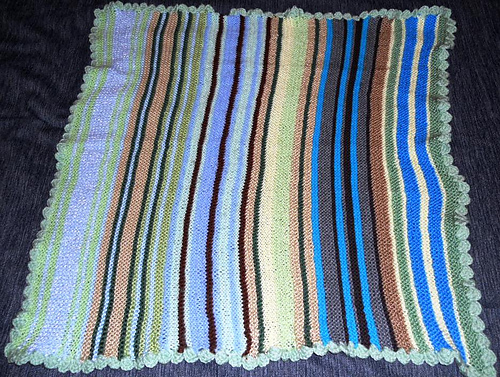 Two friends in my knitting group (Cheryl and Sheri) joined me in knitting on this blanket. We each knit two sections, and Cheryl added the border. 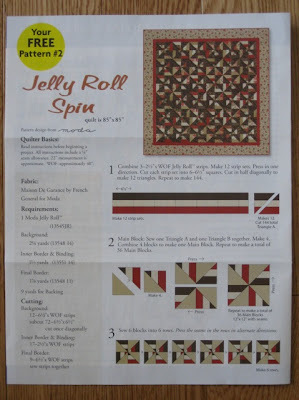 Controlled Spin was created out of necessity: the scrap pile beside my sewing machine was growing too fast and needed to be brought under control. This top is my seventh in the Twelve in 2012 Quilt of Valor challenge. The pattern was a perfect match for my 2.5 inch scrap strips. Once they were sewn in strip sets, the top came together very quickly. I like the multiple types of pinwheels in this pattern. How many types do you see? 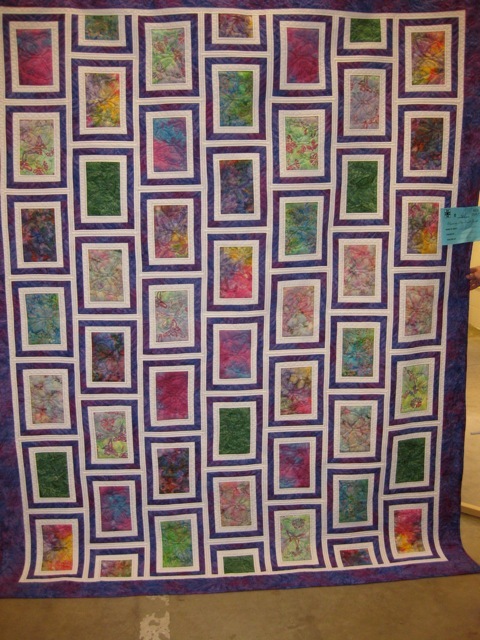 Alycia posted this quilt on her blog today. It should be wrapped around a hero soon. I joined several friends for a weekend at the Sapporo Snow Festival in February 1981. One evening we went to a German bar just down the street from our hotel. The place was hopping with live music and a rowdy crowd. 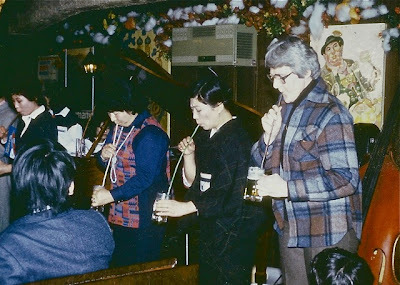 Close your eyes and imagine German music and a mix of Japanese and German beers in a crowded Japanese city. The evening was a lot of fun. My friends "volunteered" me to take part in a beer-drinking competition. The contents in the mugs clearly show who had real talent for this event. (The woman to my right in the black kimono won with amazing speed.) I discovered it is extremely difficult to drink beer through a straw: I don't recommend it. Knitting buddy, Cheryl started this blanket for the Western Region Oddball Knitters and named the blanket, Cookie Jar. It was a delight to knit. 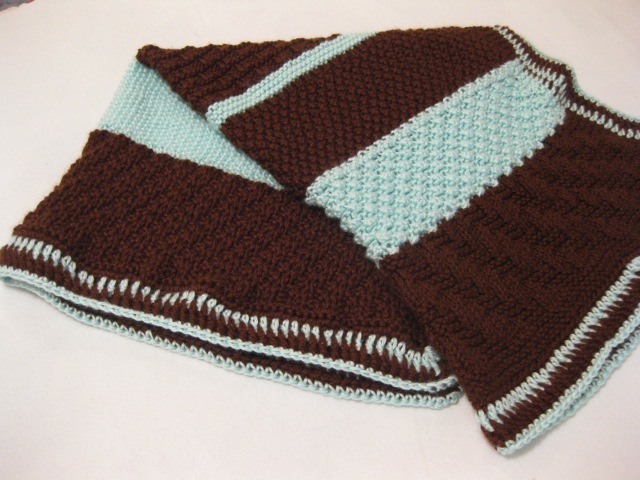 Each subsequent knitter will add a "cookie" to the blanket. Cheryl's section is Oatmeal Raisin, and mine is a stack of Oreos. Sue's ribbon blocks came together quickly and created Ribbons of Valor. 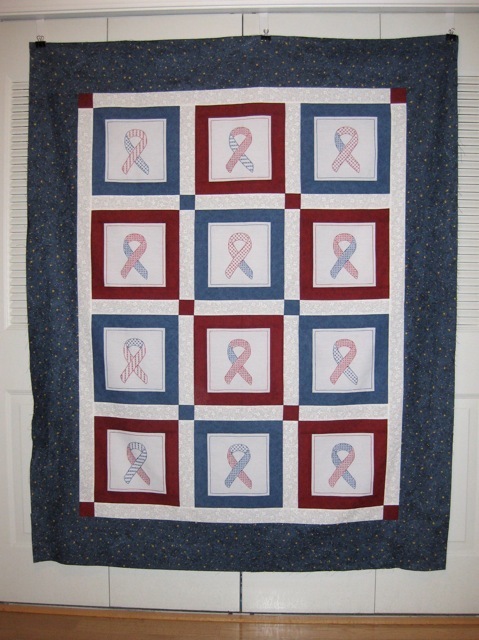 This is the sixth Quilt of Valor I've made in the 12 in 2012 challenge. Quilts 1 - 5 can be found here. I've submitted a request for a volunteer longarm quilter, so this top will be a completed quilt soon. Thank you, Sue for embroidering and donating the ribbon blocks for Quilt of Valor #6. Your generous gift will bring comfort to a healing warrior. 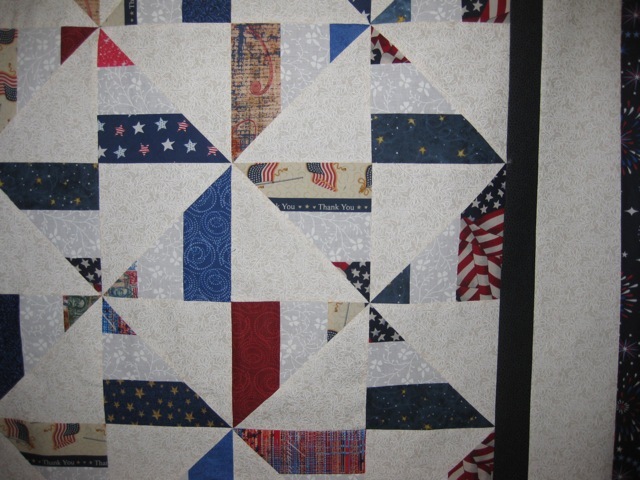 This quilt was shown on Alycia's blog today and will be wrapped around an American hero soon. Tiny Stripes is a Western Region Oddball Baby Blanket. Bailey started this cute "boy-friendly blanket" and told the knitters to use at least two colors in their four-inch section. 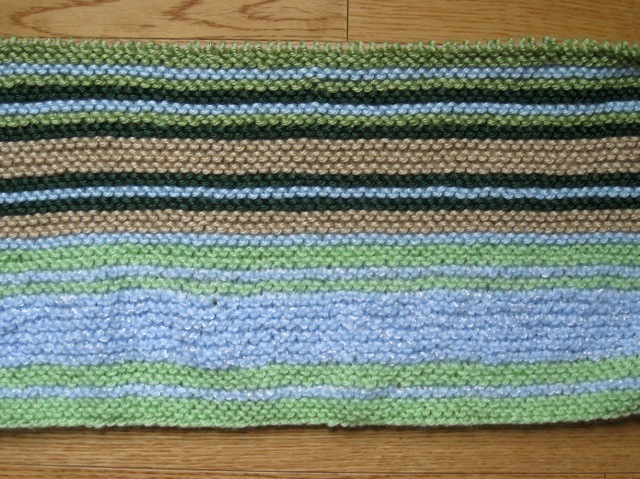 I had originally planned to use brighter colors, but when Tiny Stripes arrived in the mail, it was obvious they would over-power the first section. 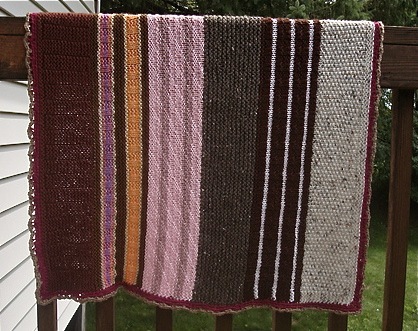 I pulled two yarns from my stash that matched Bailey's colors and added two others. 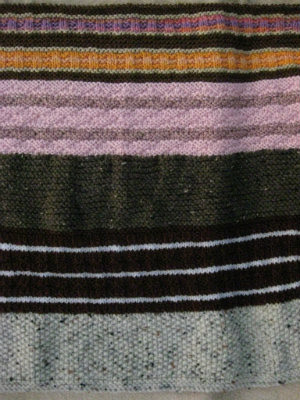 I hope that other knitters continue to match at least one color from the section preceding theirs to add some continuity to the stripes. 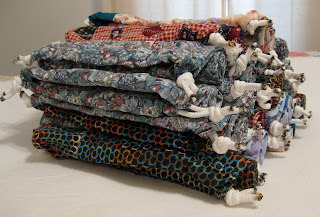 Saturday, my friend Sue surprised with twelve ribbon quilt blocks, which she had embroidered to help me meet the Twelve Quilts of Valor challenge. Each ribbon is unique, as none are embroidered the same. Yesterday, I framed the blocks and trimmed them to size. This quilt top (#6 of 12) should be finished by Wednesday. 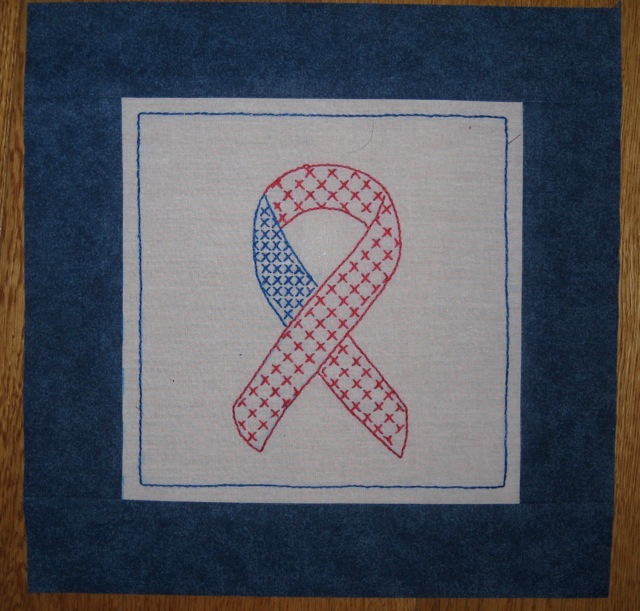 Thank you, Sue for helping make a Quilt of Valor for this challenge! 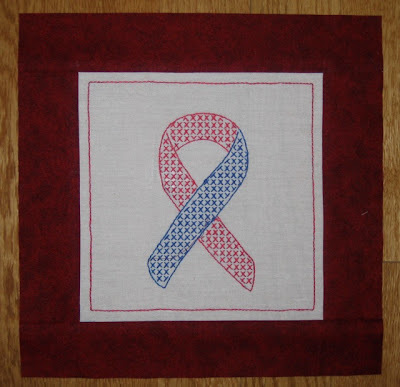 Last year, Sue and I worked together on Ribbons of Hope. 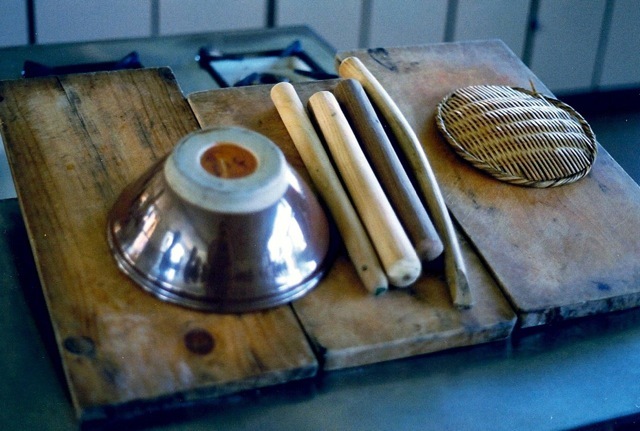 Yes, even Japanese cooks leave just-washed dishes to air-dry. I am not sure how all of these utensils were used, but I found the display interesting as we toured the school. It almost looked like someone had set up a still life. Rainbow Brights, a Western Region Oddball Baby Blanket, began its journey from Texas in early January. It then traveled to Ottawa, Canada for the orange section. I added the yellow section over the weekend, using the Single Chevron stitch and Caron Simply Soft (Lemonade). 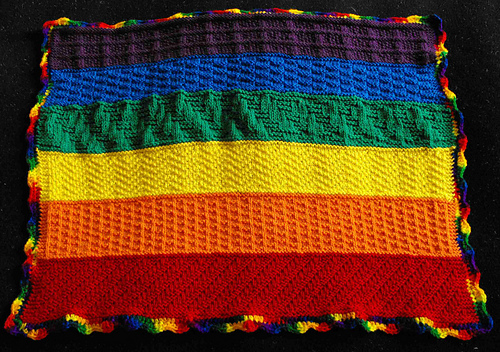 This knitted rainbow will be a happy blanket. All Crafts for Charity (a Yahoo group) selects a charity for each month. April's charity is Days for Girls International an organization that provides washable feminine hygiene kits to women and girls in impoverished nations worldwide. I used some fabric odds and ends and yardage to make 22 kit bags for this project. Finding reasonably priced cord for the drawstrings was a challenge, but I used clothesline cord. Because the cord frayed when cut, I singed the ends to melt the polyester. Two packages of clothesline was just enough for 22 kit bags, pattern link below. Sewing donation information and patterns can be found here. 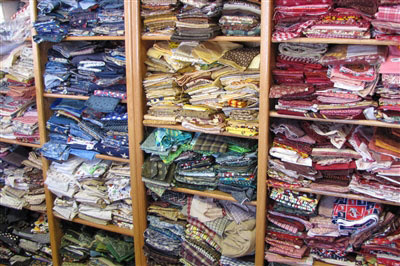 Last Friday, I read this post and started thinking about my craft stash and inventory as well as my online life. After our Mother's death, my sisters and I started the tedious process of sorting through all of Mom's craft books, quilts, quilt blocks, embroidered items, etc. It would have been nice to have some idea how she would have liked this bounty divided. We tried to disperse the items as fairly as possible by drawing numbers and making a selection, but I'm not sure everyone was happy with the process and its result. 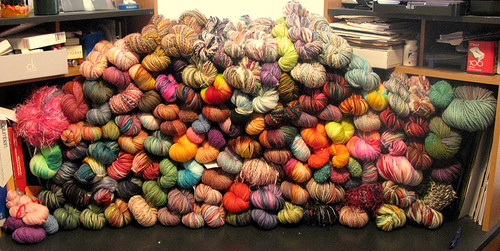 What would your family do with your yarn or fabric stash or your crafting tools? Would your family sell the items or give them to those who would appreciate and use them? Would your family know the details of your online life? 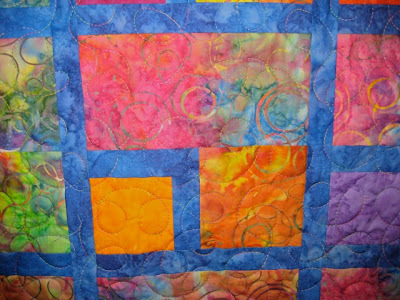 Julie from Me and My Quilts - Exploring the Possibilities has graciously allowed me to share her thoughts and Quilter's Will with my readers. 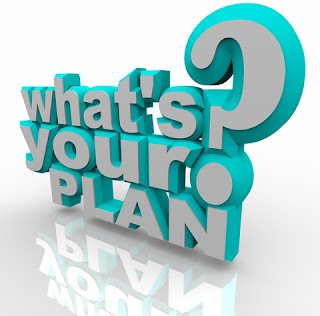 Even if you are not a quilter, please take some time to read the "will" because it can be adapted to fit any hobby. 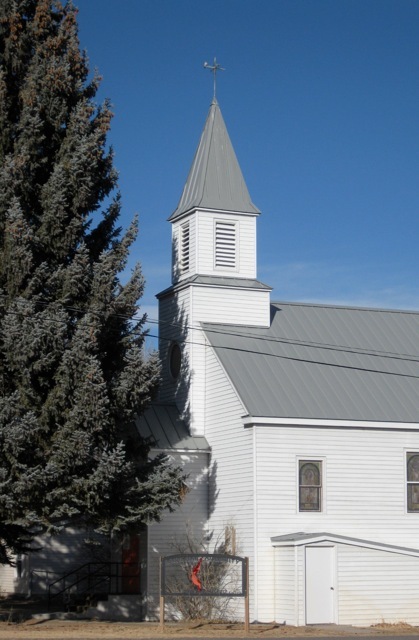 Just one block west of the old school and directly behind the school superintendent's house, the Methodist church has been a integral part of Pavillion since the late 1940s. I remember attending a Baccalaureate service in this building a week before my high school graduation. In 1969, the pine trees were barely as tall as the roof line. Now, the entry is practically hidden by the two large green spires. Sadly in cases like this, the trees are felled. Have you noticed that trees are commonly planted without considering how large they will eventually grow? The design and atmosphere of Glover Garden depict the image many people have of the scenes in the short story and opera "Madame Butterfly" by Puccini. Glover House has thus been named "Madame Butterfly House." 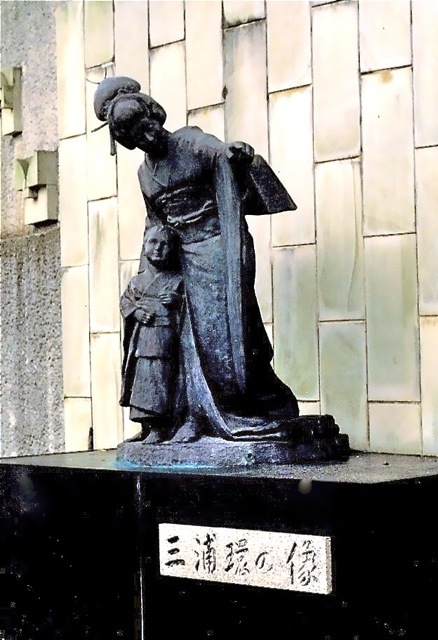 Statues of Puccini and diva Miura Tamaki (1884 - 1946), who played Cio-Cio-san, have been placed in Glover Garden. It was dreary when we toured the garden and the house, but it was still beautiful. I am not a fan of batik fabric or of the color orange, but I loved the design of this quilt. 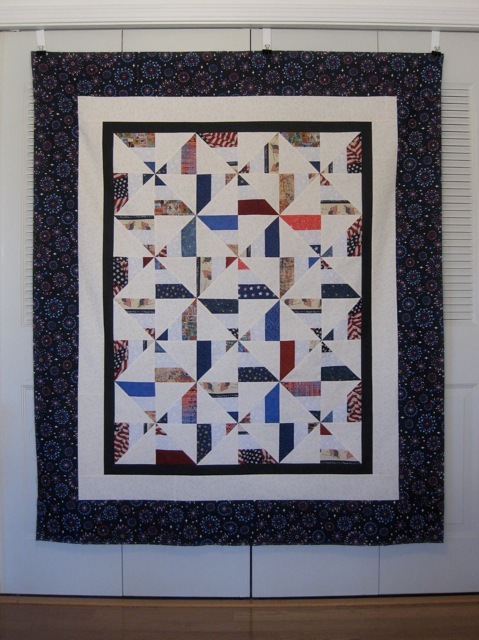 The block construction and the tiny squares in the blue border appealed to me. Here's a close-up of the block. 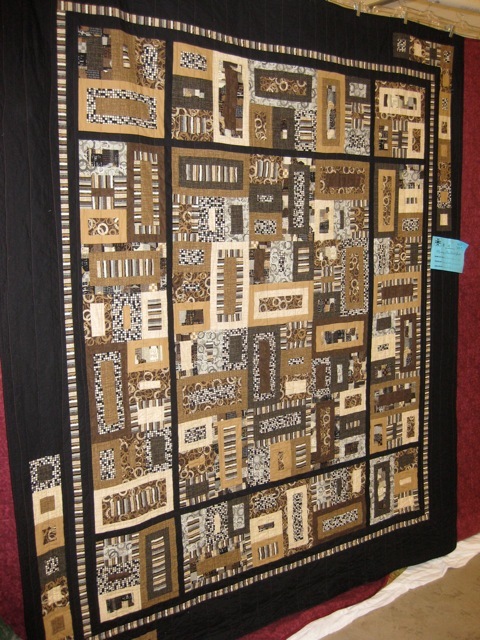 As Sheri and I were examining the quilt, a woman stopped to explain the construction of this block. 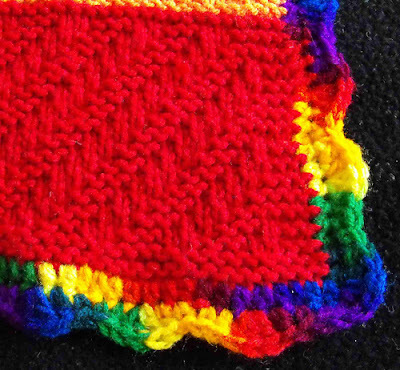 The block is started with the small square in the lower left - it can be any size you wish. This one was about 2 inches finished. That square is framed on two sides (the blue on the top and right side of the square. 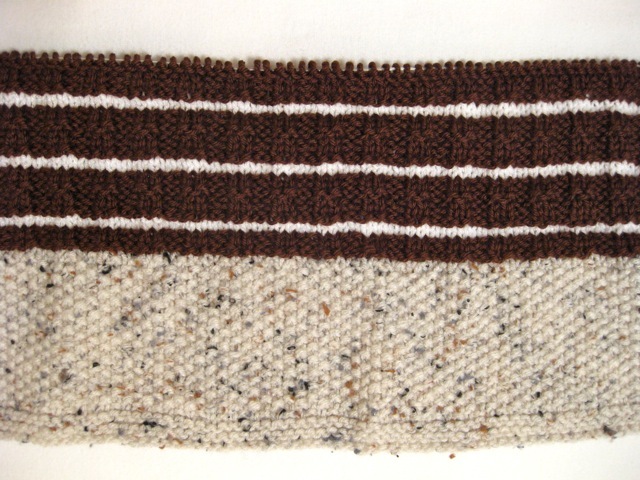 In this case, the strip is about 1 inch wide finished. The large orange square to the right is then added. It is the same size as the smaller square with the two-sided border. The top rectangle is then added. It is cut the same width as the two bottom pieces and is the same height. 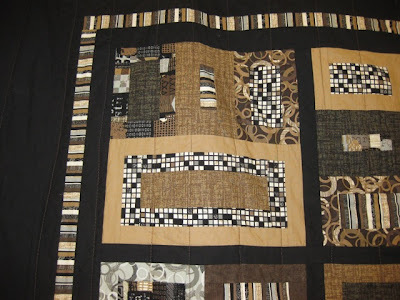 All of the blocks are then sashed with the same fabric that frames the smallest square. This block is based on some mathematical theory, but I didn't catch the name. I plan to make some of these blocks this year. 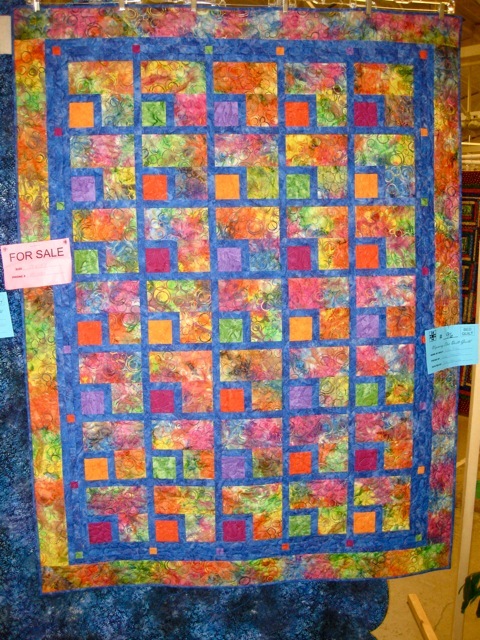 Saturday, I attended the Winter Quilt show with my friend, Sheri. We wandered through the large building that was packed with quilts for nearly two hours. 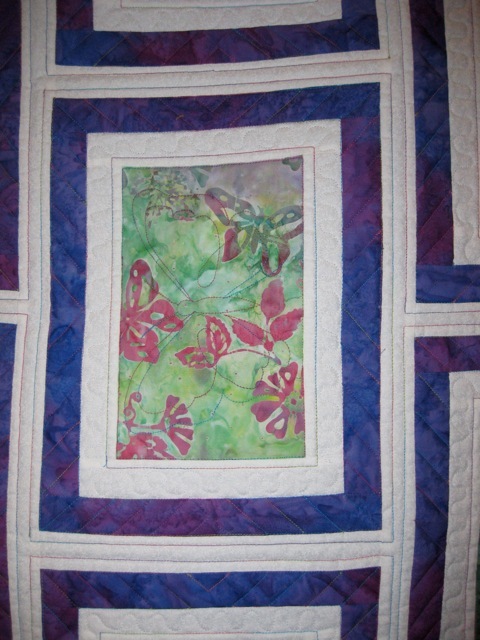 The quilt, shown above was gorgeous, yet the blocks and quilting were very simple. I especially liked the corner border design. The fabric resembling a crossword puzzle, grabbed my eye on this quilt. 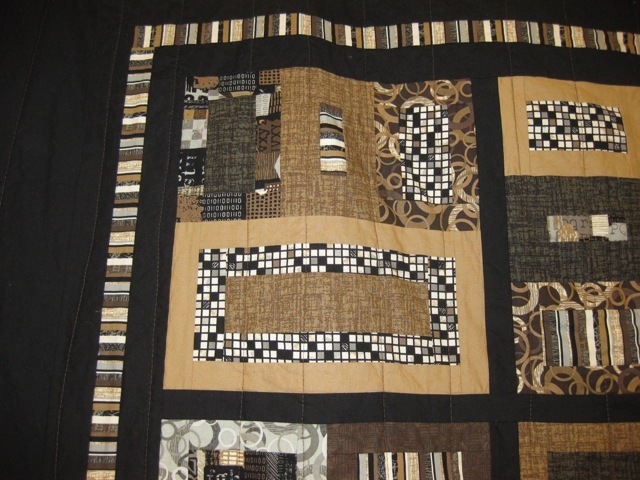 The block, made with different fabric placement, is rotated and repeated throughout the entire quilt. Another example of using a simple block and off-set placement to make a stunning quilt. The rectangles of feature fabric were framed and then separated with white sashing. It doesn't get any easier than that. When I was a child, this building seemed much larger, yet it is only the size of a storage shed. Eventually, the library moved to a different location, and the then vacant building was sold in 1959 to Forrest Morgan, who used it as a shed. Fast forward several decades. 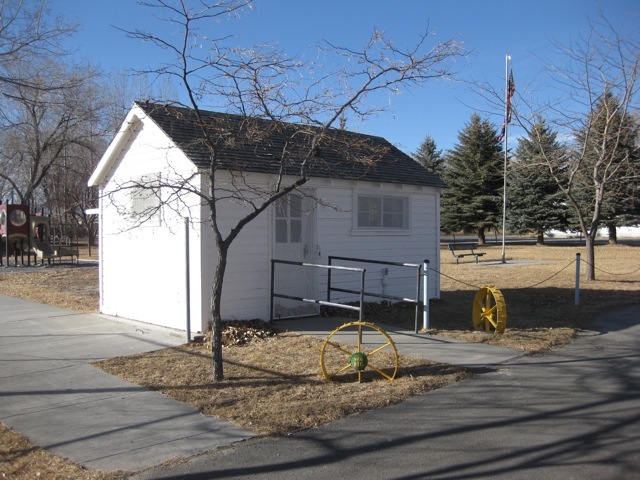 The town repurchased the building, moved it to its original site, and created a local museum. 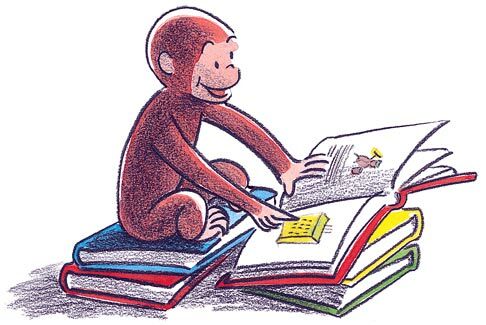 I remember going into this tiny building and finding it packed with books like My Friend Flicka, Curious George, Nancy Drew and so many others that have faded from my memory. I think the building had a wood stove as well, but that memory is not as clear. I just remember it was a magical place, filled with adventures. Other town librarians in the early years were Mrs. Harold Smith, Mrs. Alice Walker and Mrs. Olive Harebo. Now, the little, white building is the local museum (open only in the summer, usually by appointment).